Any fan turning up to watch England play their opening Six Nations match against Wales on Sunday will not be able to see at least 15 of the World Cup-winning squad because of injury, retirement or sevens. You can imagine the voices from the St Helen's pitchside: "Mummy, where's Katy Mclean?" The answer is the captain is in Brazil because of a clash of dates and team priorities. After lifting the World Cup in August, plenty has changed for England's women although they remain favourites for the Six Nations despite their new look. The day after the Red Roses beat Canada 21-9 in Paris and the front pages of the national newspapers toasted their success, changes were well underway at the Rugby Football Union (RFU). Eight days later it was confirmed 20 players would become full-time professionals. But the contracts were for those women to focus on qualifying for the Rio 2016 Olympic Games in rugby sevens, not just on defending their title at the next XVs World Cup. "The RFU focus at the moment is doing as well as we possibly can in both (Sevens and XVs)," interim head coach Nicky Ponsford said. "I know that's challenging. We want to use this Six Nations to really start our building process and develop some of the players coming through. "We really want to qualify for Rio and qualify the GB slot, so that's got to be high on our agenda but a balance between the two is what we're trying to achieve." To qualify for the Olympics, teams have to finish in the top four of the Women's Sevens World Series. It is a six-weekend series spread across the season and the globe. The opening weekend of the Six Nations coincides with the second leg of the series in Sao Paulo, Brazil. The fourth weekend of the Six Nations clashes with the third leg of the series in Atlanta, United States. Seven members of England's 14-strong sevens squad that has travelled to Brazil were World Cup winners in Paris. Further complicating the situation is that World Cup-winning coach Gary Street has left his role by mutual consent - less than two weeks before the start of the Six Nations. The timing of his departure appeared bizarre to outsiders. If it had been England men's head coach Stuart Lancaster, the uproar would still be ringing in our ears. "After the World Cup there's been a lot of reflection. We've looked at what we think from our perspective the right thing is going forward," Ponsford told BBC Sport. "We're three years away from a World Cup, we don't want to be making a decision in just three weeks. We didn't want to rush. These things do take time. "We respect Gary's decision, it's not necessarily the perfect timing for us, but ultimately we respect it, and have to thank him for what he's put into the game over the last 15 years." Despite some of the dramas, the women's game is on an upward trajectory although sevens coach Simon Middleton says he will not see his team's true potential until next year. "You won't get the benefit until about 18 months of professionalism," he said. "In terms of athletic development a lot of the girls have not experienced this level of training, particularly their strength and conditioning. An athlete might have been playing from 16 to 26 so she's got 10 years' experience but when it comes to weights her training age is zero." "We started the programme when we did because we knew they'd peak six months before the Olympics." Middleton has been impressed with their progress. "Every athlete responds differently to their conditioning programmes, but in general they've all made huge gains especially on the skin folds," he said. Skin folds are the underlying fat beneath a person's skin formed by pinching. The thickness of the fold is a measure of their nutritional status. For professional athletes the data gathered should be seen to decrease. "Obviously the skin folds after the World Cup went up after plenty of celebrations and a month off. They went through the roof on some of them, but you can see they've worked their way back," Middleton said. "The acid test for me was what happened over Christmas when they had a two-week self-managing period. With the exception of one of two of them, they've all come back in a better state than when they've left. I think that says everything about them. I couldn't praise them enough." The women's sevens are taking inspiration from their male counterparts, who were runners-up in the 2013 Rugby World Cup Sevens. "I was lucky to go in and train with the men before Christmas and where they've got to now having been in it for a few years was incredible. 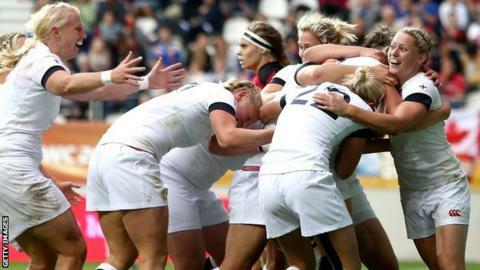 We just hope we follow suit," women's sevens captain Abi Chamberlain said. "It's not just that they're boys and they have more than us. We know they were in exactly the same place as us a few years ago, they had the same limitations to their programme because it was new and you can't just throw everything into it, you have to wait and see what's needed. One of the most prominent players hoping to win a place in the GB Olympic team is England captain Mclean, who has said she is not turning her back on XVs and is committed to retaining the World Cup in 2017. In the fly-half's current XVs absence, Darlington Mowden Park team-mate Tamara Taylor has been named skipper for the start of the Six Nations and the coaches will review the decision game by game as England chase their first title since 2012. "We need to step up to the plate, this is a new chapter for England a brand new era, we need to start again," lock Taylor said. "We went through a phase of winning the Six Nations for a few years [seven in a row] and you never take a win for granted but we were the dominant force. "Then Ireland came in (2013) and played fantastically. Then France beat us and it was very well deserved last year but I'd really like to get it back, desperately." The depth of talent in England makes them favourites for this Six Nations title, even if the names on the team sheet will be a little unfamiliar.